The next big release form Under Armour will be the Curry 3Zer0, but before they officially become available there are still more Curry 3 colorways set to release. 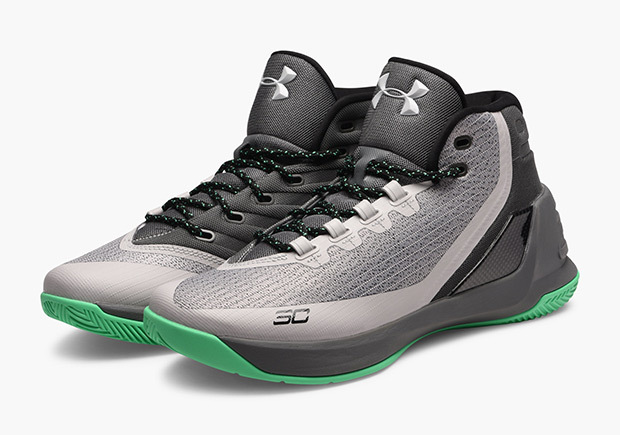 One of those is the UA Curry 3 Grey Matter edition. This Curry 3 takes inspiration from Steph’s high basketball IQ that comes dressed in a clean makeup. Featuring Dark and Light Grey tones throughout the upper, along with Black detailing and contrasting Green accents on the speckled laces and rubber outsole. Take a closer look below and you can now find the UA Curry 3 “Grey Matter” arriving to select Under Armour retailers, including shops like Caliroots.